A school friend of mine sent me this advertisement. She had found it in a teenage magazine we all read at the time called Tammy and Sandy. 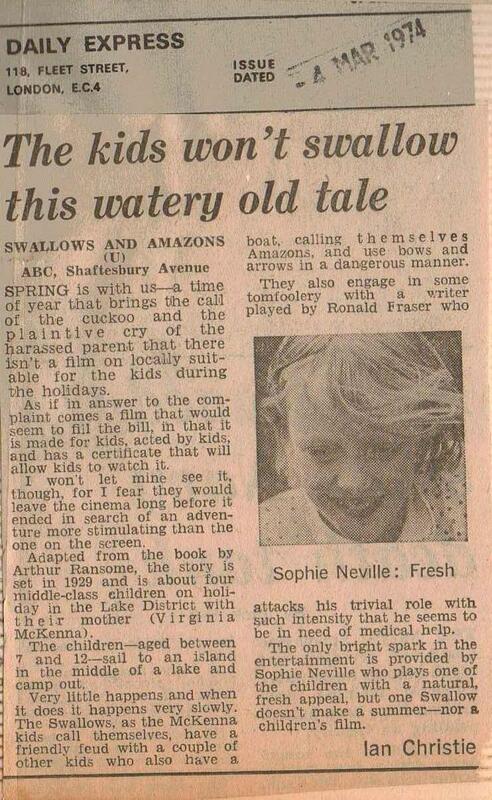 There was a similar one in The Sunday Times newspaper – and no doubt many others. Film posters hung in the London Underground and at cinemas throughout the country. 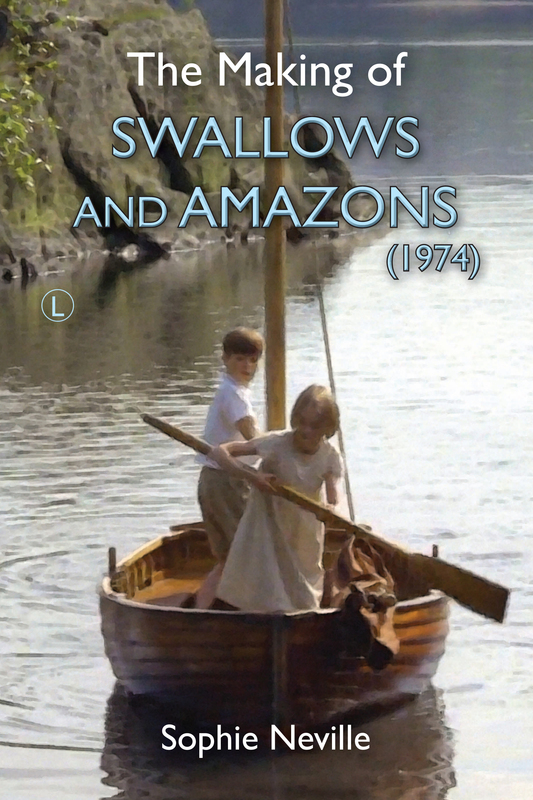 Swallows and Amazons was to come out, on general release for the Easter Holidays. 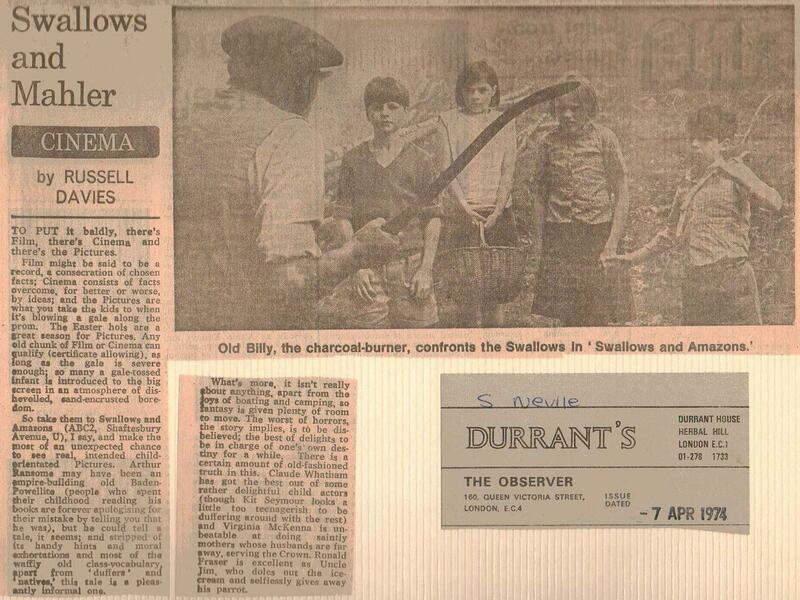 My mother subscribed to a press clippings agency called Durrant’s ~ Durrant’s of Herbal Hill London ECI ~ who, for a fee of £50, sent her all the articles written about the film. The Prince of Wales told a friend of mine that he never reads the newspapers. I know why. Reading about yourself is upsetting – or can be, especially if the facts are incorrect. My mother didn’t mind. She highlighted the bits about me, filling four albums. 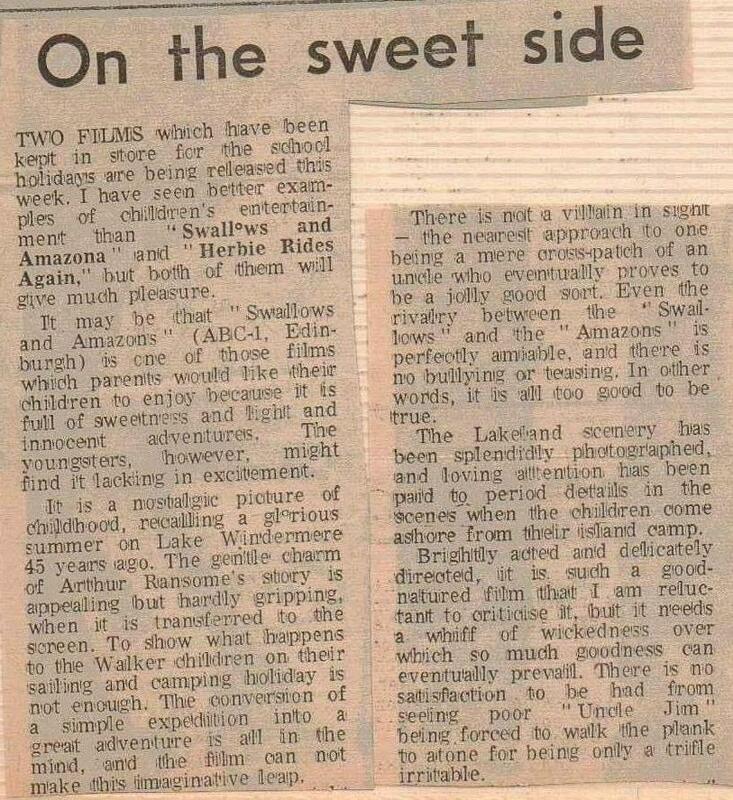 After entertaining the Daily Express so nicely in the Lake District this is what they printed about the film. I would think this is written by Ian Christie (1927-2010) the jazz clarinetist, who had formed the Christie Brothers Stompers with his brother Keith, and became a member of Humphrey Lyttelton’s band. He worked as a theater and film critic for the Daily Express for twenty-six years. Born in Blackpool and a habitue of Fleet Street pubs he held fiercely Left-wing views. 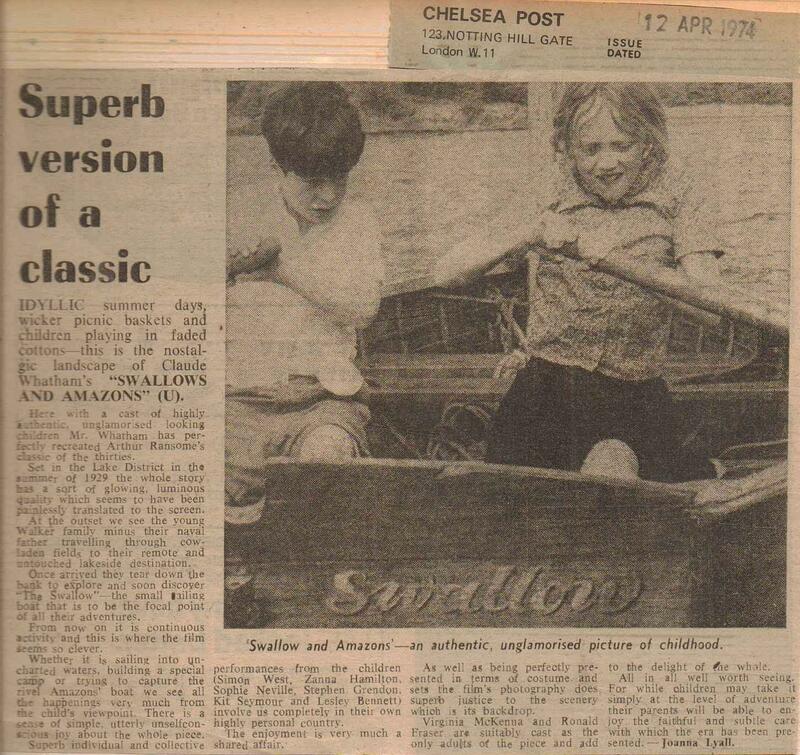 However, Russell Davies of The Observer, another jazz musician who now presents Brain of Britain on BBC Radio 4, saw that the film of Swallows and Amazons had niche. (If you click on the article it will enlarge). My favorite article wasn’t found by Durrant’s. It was written in The Brownie and must have been sent to me by a fan. 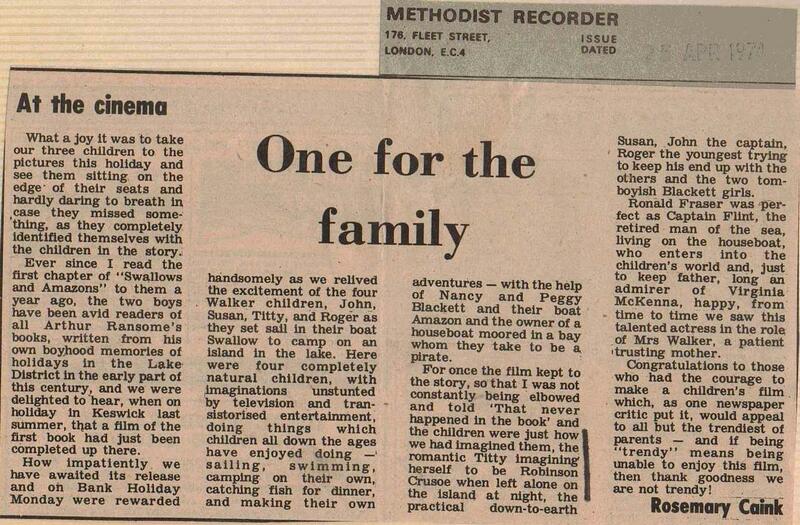 Please click on the article to find out more about the Brownies. I have many more articles ~ please let me know in the Comment box if you would like to see more. Otherwise I will move on to write about how the public responded and what happened next. It’s a little bit difficult to read some of them, e.g. the Russell Davies one – tried blowing the photo up but not enough pixels. Not sure how to solve this short of a transcript! Never mind. We love’em anyway. If I click on the photo of the Russell Davies article it enlarges well enough to read it. 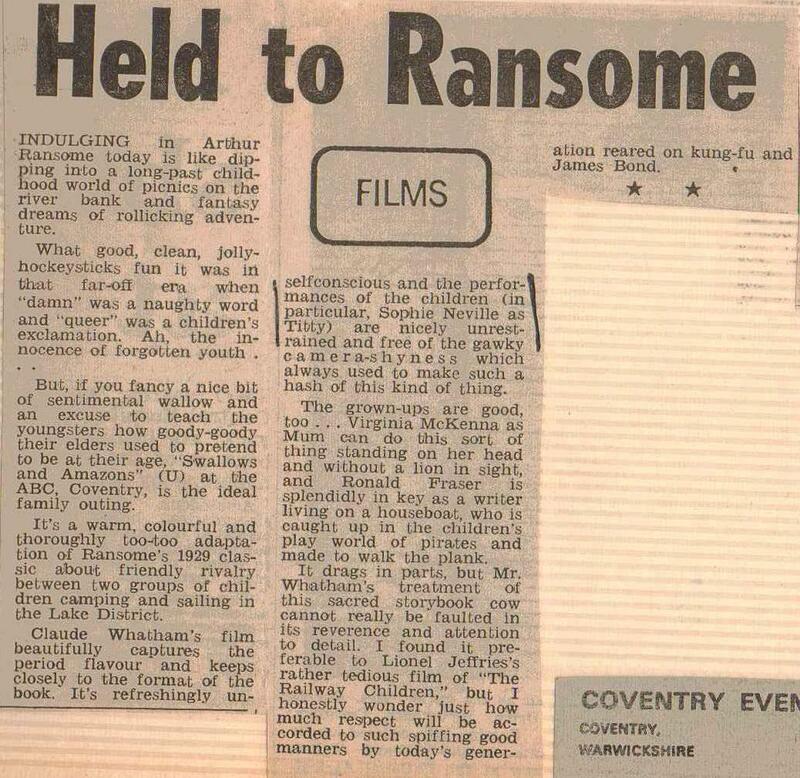 I hope people don’t mind finding too many of these of these old press cuttings. Ah, yes, that does help. I’ve also found a Magnifier app on my computer which does ditto. Thanks! The small articles Blog better than the larger ones. I am so glad you are interested in reading them. I found it difficult to read them at the time and, in a way, still do. I am sure the others in the cast would agree with me.